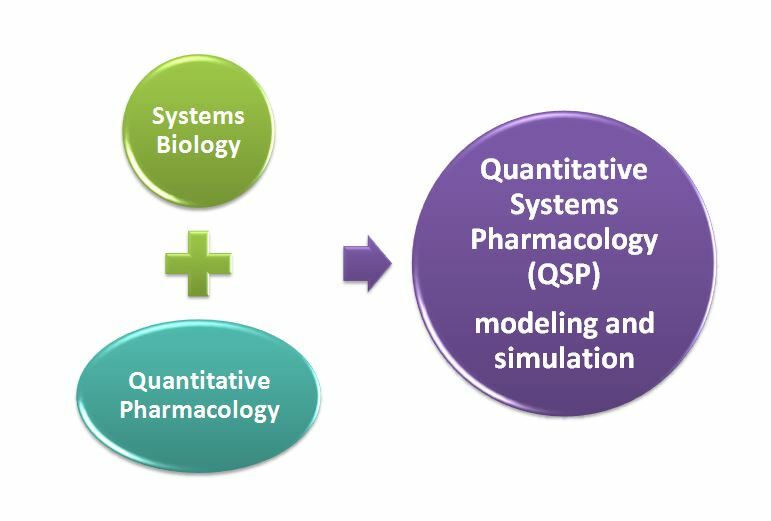 Quantitative systems pharmacology (QSP) modeling and simulation is integration of two disciplines that have been increasingly useful in pharmaceutical R&D; combination of Systems Biology and Quantitative Pharmacology. Systems Biology is the field of biomedical research including those between genes and biologically active molecules to develop models of these systems that are usually qualitative in nature. Quantitative Pharmacology is the field of biomedical research that seeks to use computer aided modeling and simulation to increase our understanding of the pharmacokinetics and pharmacodynamics of drugs, and to aid in the design of preclinical and clinical experiments. QSP is a rapidly growing discipline that incorporates computational modeling and experimental methods to investigate drug action. Traditional pharmacokinetics (PK) has been a major challenge in classical drug discovery: many compounds failed because they had unfavorable PK half-lives or distribution in humans. The traditional PK rarely takes into account the physiology and biology of the human body. However, physiologically based PK (PBPK) is built mainly from drug-independent system information. This has been attributed to a greater connectivity to in vitro–in vivo extrapolation (IVIVE) techniques for predicting drug absorption, distribution, metabolism, and excretion (ADME) and their variability in humans. PBPK–IVIVE linked models have repeatedly shown their value in guiding decisions when predicting the effects of intrinsic and extrinsic factors on PK of drugs. Therefore, it will be a better strategy in extending the success of PBPK–IVIVE to pharmacodynamics and drug safety.